A small round-oval damson, being the first to ripen during season. It has green-yellow flesh with a good flavour. Also known as Bradleys King'. A large late season damson. Purple skin with a blue bloom. Greenish yellow, dry flesh. Very productive. Self fertile. Round to oblong fruit. Large for a bullace and more like a small damson. Blue-black bloomy skin. Firm, green flesh. Good for culinary use. Self fertile. 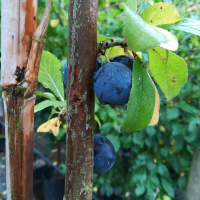 Large blue-black damson, sweeter than most. Heavy, regular crops Will succeed in exposed, wet districts where plums may fail. Also suitable for dessert use. Self fertile. The greengage of Damsons.Self-fertile reliable free fruiting Damson. Excellent flavour. Medium, blue/black fruits with good flavour.